This copy showed us a Spike we never knew existed — so much energy and presence to the sound, it came jumping out of the speakers and simply refused to mind its manners. Elvis should be proud. Why don’t more records sound like this? This is one of the best batches of songs Elvis (and his buddy Paul McCartney) ever wrote! 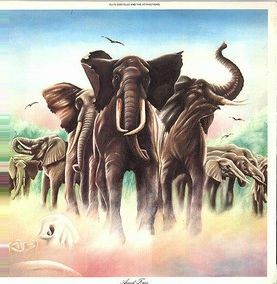 Posted in *Our Record Overview - The Good, Genre - Rock - Big Production Rock, Labels We Love - Warners, Records that Sound Best on the Right Import Pressing, Top Artists - Elvis Costello, Top Engineers - Geoff Emerick and tagged audiophile vinyl, Better Records, Hot Stampers, tom port on March 29, 2019 by humorem. Two excellent sides for this rip-roarin’, twenty song, five star rated Elvis Costello extravaganza! This is the record that came right after Armed Forces, which is a huge favorite around these parts, and the venerable All Music Guide gives both albums five big stars. I’m not sure I’d go quite that far, but it’s certainly full of good material. Out of the twenty songs on here, exactly one clocks in at over three minutes. Posted in Five Star Albums, Genre - Soul - Blue Eyed Soul, Records that Sound Best on the Right Import Pressing, Top Artists - Elvis Costello and tagged audiophile vinyl, Better Records, Hot Stampers, tom port on September 9, 2018 by humorem. I’m embarrassed to say we used to like the Rhino Heavy Vinyl version, and in our defense let me tell you why: it was (for the most part) tonally correct, fairly low distortion, and had tight punchy bass. Boy, was we wrong. Now it sounds positively CRUDE and UNPLEASANT next to the real thing — if by “the real thing” you mean an honest to goodness Hot Stamper copy. The average copy of this record is aggressive and unpleasant. The British pressings are mud. You either have to work very hard to find a good one (which means buying, cleaning and playing lots and lots of them), or you have to luck into a good one by accident. Posted in *Our Record Overview - The Really Not Good At All, Genre - Rock - Punk Rock / New Wave, Heavy Vinyl Disasters, Labels We Love - Columbia/Epic, Records that Sound Best on the Original, Records that Sound Best on the Right Domestic Pressing, Top Artists - Elvis Costello, We Was Wrong and tagged audiophile vinyl, Better Records, hot stamper vinyl, Hot Stampers, hot stampers vinyl, tom port on July 18, 2018 by humorem. Posted in *Our Record Overview - The Good, Advice - What to Listen For - Bass and Whomp, Five Star Albums, Genre - Rock - Alternative Rock, Top Artists - Elvis Costello, Top Producers - Nick Lowe and tagged audiophile vinyl, Better Records, Hot Stampers, tom port on May 8, 2018 by humorem. Posted in *Our Record Overview - The Good, Genre - Rock - More Pop than Rock, Records that Sound Best on the Right Import Pressing, Top Artists - Elvis Costello and tagged audiophile vinyl, Better Records, Hot Stampers, tom port on May 2, 2018 by humorem. Six of Elvis’s first seven albums received a Five Star rating from Allmusic, the exception being Almost Blue, and we generally would agree with that assessment (although Get Happy should probably get Four Stars also, not Five). Which is to say that Elvis Costello is a brilliant artist whose albums work as albums, a fact that is in danger of being lost in a world of single song downloads and greatest hits packages. We record-playing audiophiles are inclined to start at the beginning of a side and let if flow through to the end, and that is clearly the best way to appreciate and enjoy the work of this very gifted man. Posted in *Our Record Overview - The Good, Genre - Rock - Big Production Rock, Genre - Rock - More Pop than Rock, Labels We Love - Columbia/Epic, Top Artists - Elvis Costello, Top Engineers - Geoff Emerick and tagged audiophile vinyl, Better Records, Hot Stampers, tom port on April 28, 2018 by humorem. British Guy, British Pressing… Right? The British pressings are simply not competitive with the best domestics. No import, from any country, can touch a good Columbia pressing from the states. The most common stampers for the Columbia pressings have never sounded very good to these ears, but that doesn’t mean there aren’t some killer copies with different stampers sitting in the bins wearing the generic ’70s Red Columbia label. We’ve heard them. Wish we could find more of them but they are rare and only getting rarer. Posted in *Our Record Overview - The Good, A List of Great Debut Albums, A List of Personal Favorites, Advice - Understanding Records, Difficult to Reproduce Recordings, Five Star Albums, Genre - Rock - Punk Rock / New Wave, Labels We Love - Columbia/Epic, Masterpieces of Rock and Jazz, Records that Sound Best on the Right Domestic Pressing, Top Artists - Elvis Costello, Top Producers - Nick Lowe and tagged audiophile vinyl, Better Records, hot stamper vinyl, Hot Stampers, hot stampers vinyl, tom port on April 18, 2018 by humorem. We consider Armed Forces to be one of the best sounding rock records ever made, and a copy like this White Hot Shootout Winner is proof enough to back up our claim. The best copies are extremely transparent and silky sounding, but with unbelievably punchy, rock-solid bass and drums. The sound of the rhythm section ranks with the best we’ve ever heard. Beyond that, the musical chops of this band at this time rank with the best in the history of rock. Steve, Bruce and Pete rarely get the credit they deserve for being one of the tightest, liveliest backing bands ever to walk into a studio or on to a stage. The song Oliver’s Army on the first side is a perfect example of what we’re talking about. Rock music doesn’t get much livelier than that. Skip on down to Green Shirt for another track that’s as punchy as they come. Posted in *Our Record Overview - The Good, A List of Personal Favorites, Advice - What to Listen For - Energy, Demo Discs for Bass, Demo Discs for Recordings that Are Doing It All, Five Star Albums, Genre - Rock - Big Production Rock, Genre - Rock - Big Rock Sound, Labels We Love - Radar/ F-Beat, Our Top 100 Rock and Pop List, Records that Sound Best on the Right Import Pressing, Top Artists - Elvis Costello, Top Engineers - Roger Bechirian, Top Producers - Nick Lowe and tagged audiophile vinyl, Better Records, hot stamper vinyl, Hot Stampers, hot stampers vinyl, tom port on April 8, 2018 by humorem. The drums have real body and resonance here, a far cry from the wimpy cardboard drums so many rock records have. Listen to the drum sound on Charm School. Man, those are some BIG FAT PUNCHY DRUMS — very reminiscent of Bowie’s Let’s Dance. The drum sound on that album is some of the best we’ve ever heard, bar none, and this copy was also OUTSTANDING in that regard. Posted in *Our Record Overview - The Good, A List of Personal Favorites, Advice – What to Listen For - Rock Records, Five Star Albums at Better Records, Genre - Rock - Big Production Rock, Genre - Rock - Big Rock Sound, Records that Sound Best on the Right Import Pressing, Top Artists - Elvis Costello and tagged audiophile vinyl, Better Records, hot stamper vinyl, Hot Stampers, hot stampers vinyl, tom port on March 9, 2018 by humorem. TRUST is my favorite Elvis Costello album, although the first album is every bit as good. By the way, we played a domestic copy of this album, just for fun you might say, and sure enough, it was a real mess. Boosted highs, poor bass definition and copious amounts of grit and grain — ’70s Columbia at their best, what else is new? The first album and Spike are the only Elvis records I know of that sound good on domestic vinyl. Forget the rest. If you love Elvis Costello as much as we do around here, we suggest you do yourself a favor and trash your domestic LPs — you need a British copy to even get in the ballpark, and that’s far from a guarantee of good sound. Elvis is “Still the King,” but you would never know it without the right pressing. Posted in *Our Record Overview - The Good, A List of Personal Favorites, Demo Discs for Bass, Genre - Rock - Big Production Rock, Genre - Rock - Big Rock Sound, Records that Sound Best on the Right Import Pressing, Top Artists - Elvis Costello and tagged 1980, audiophile vinyl, Better Records, hot stamper vinyl, Hot Stampers, hot stampers vinyl, tom port on January 29, 2017 by humorem.